I’m going to the ITC 40k Bunker War next weekend. It’s the first of 6 tournaments I have lined up before the LVO early next year. I’ve never been to this tournament before and I have no idea what to expect. So I think I need a reasonably balanced Harlies list. A quick recap on the games and some thoughts on the list. Embrace your Inner Geek here with the Third instalment of my Harlequins Review. This time the generic Stratagems and Enigmas. 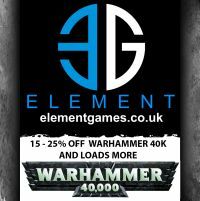 Embrace Your Inner Geek here again with the second instalment of my Harlequins Codex review. Up this time, Masques. Masque forms, are the Harlequin equivalent of “chapter tactics”. There are 6, and all have associated Enigmas (what Harlies call their Relics), Warlord Traits and Stratagems. In this instalment I’ll deal with each of the Forms, and discuss their associated rules. They’re not all great to be honest, but there are a couple of really good one. Hey guys! Apologies for the lack of updates, real life is conspiring against us right now demanding our time. Check out these pictures of the Stronghold VII event in the meantime! Caledonian Deathwatch Network is running a second sunday event! After the huge success of Eternal Warrior last year, we’re bringing it back again.